In a previous blog post we explored the irreversible redox reaction of ascorbate using the Rodeostat potentiostat. 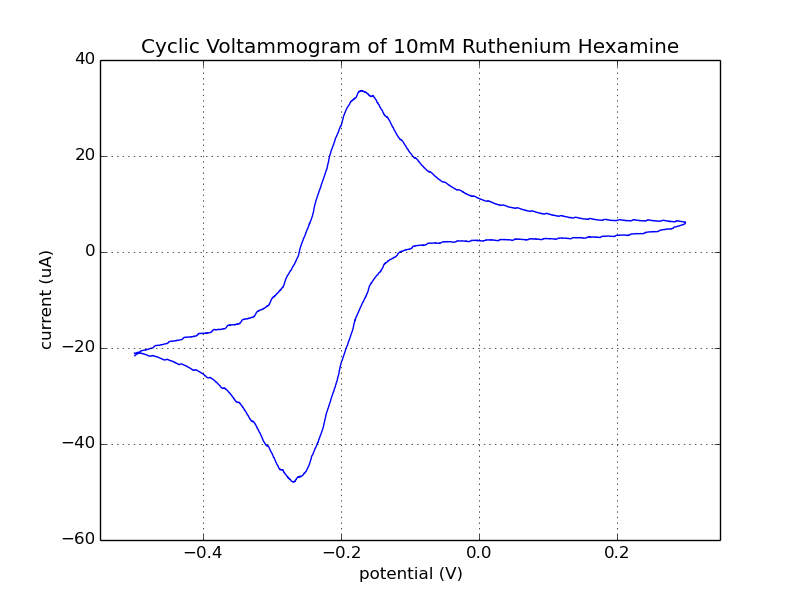 In this blog post we carried out a cyclic voltammetry experiment with ruthenium hexamine Ru(NH3)6 a reversible redox couple. An example voltammogram of this redox couple is demonstrated in the Pine electrode literature and we have previously described this experiment using the Cheapstat potentiostat. 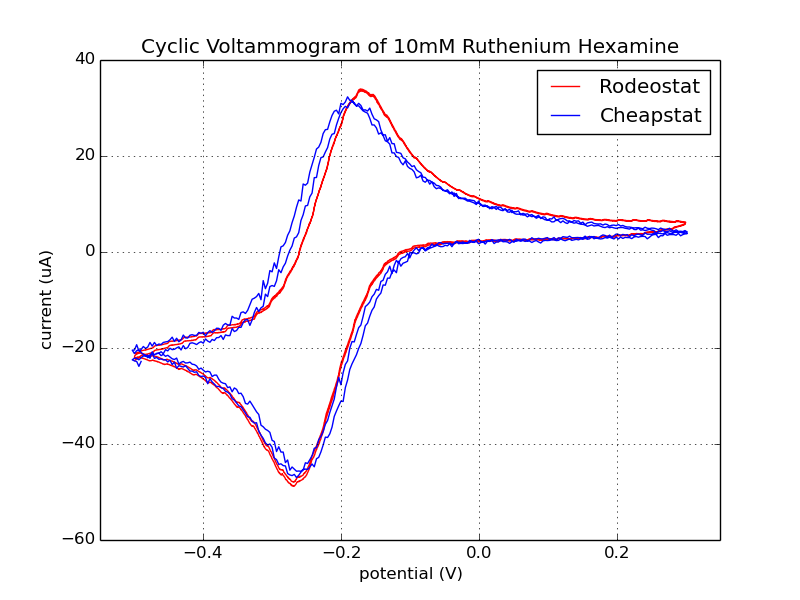 Here we have repeated this cyclic voltammetry experiment using the Rodeostat potentiostat. A Pine screen printed carbon electrode was also used. To prepare 500 mL of a 0.1M KCl solution: transfer 33 mL of 3M KCl (LabChem Part # LC18795-1) into a 500 mL volumetric flask. Fill to line with distilled or deionized water. Place stopper in flask and invert several times to mix. Add 4 mL of 0.1M KCl to the bottle containing 250 mg of 10mM Ru(NH3)6. Mix until dissolved. This is a 0.2 M stock solution. Add 50 µL of the 0.2 M stock solution to 1 mL of 0.1 M KCl in a microcentrifuge tube. 50 µL of sample was pipetted onto the Pine electrode. After taking several background measurements with 0.1M KCl, the ruthenium hexamine was tested. 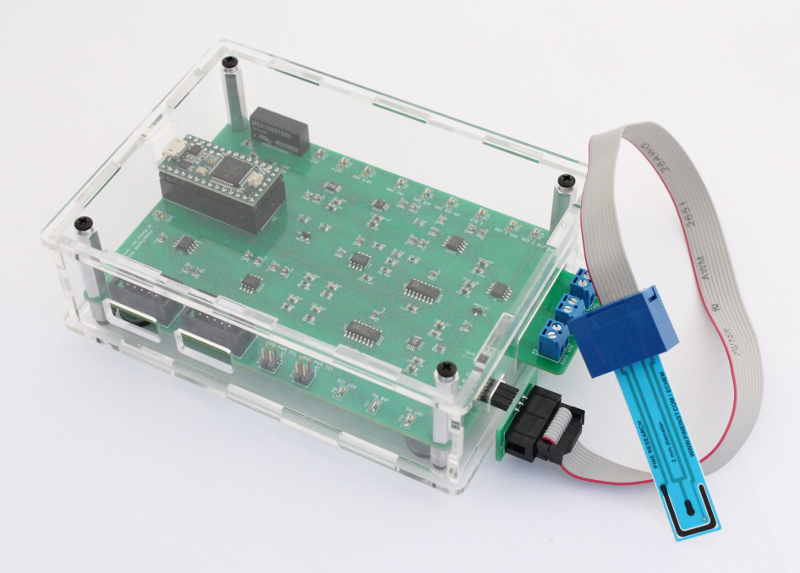 Samples were also run with the Cheapstat potentiostat for comparison. Fig 1. The result shown below is data collected from the 3rd cycle of the CV run with the Rodeostat potentiostat. Fig. 2. Data collected from the 2nd and 3rd cycles of the CV run with the Rodeostat and Cheapstat potentiostats. You can see that the two CV runs from the Rodeostat (shown in red) overlap and are hard to distinguish. Like the data from the ascorbate experiments, there is less background noise in the data collected with the Rodeostat likely due to the higher resolution analog-to-digital converter and precision components.